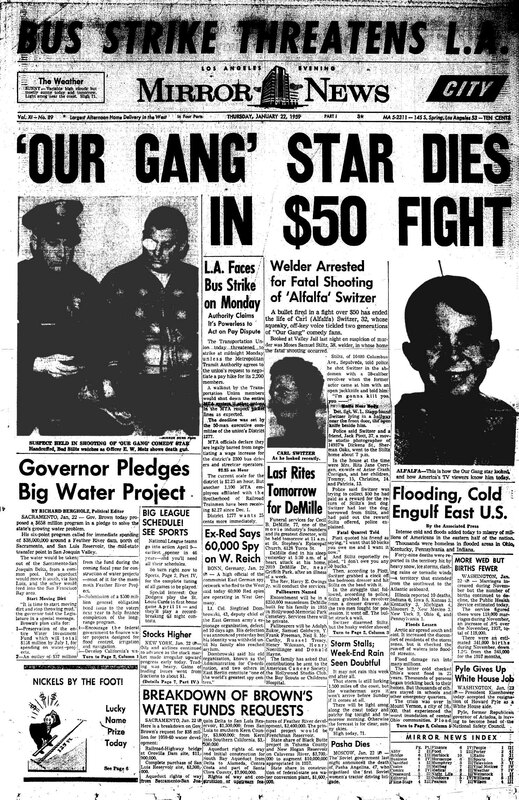 Jan. 22, 1959: Carl ‘Alfalfa’ Switzer is shot to death in a fight with Moses Samuel Stiltz. According to police, Switzer borrowed a dog belonging to Stiltz, then lost the dog. Switzer paid $50 for the return of Stiltz’s dog. Switzer decided Stiltz owed him the money and a fight ensued. Somewhere there should be the line: “both had been drinking heavily” and here we have it: “Switzer had three beers and a Martini.” The shooting occurred at the home of Rita Jane Corrigan, former wife of Ray “Crash” Corrigan. Keith Thursby writes: I finally found a Times story in which the paper talked about people living in the Chavez Ravine area. Cordell Hicks’ short story told of some local kids who tried to find a place in their neighborhood to play baseball. Note: This post was published in 2009 on latimes.com and is available via Archive.org. This entry was posted in 1959, Baseball, Crime and Courts, Dodgers, Film, Hollywood, Keith Thursby, LAPD, Obituaries and tagged #Chavez Ravine, 1959, Baseball, Carl Alfalfa Switzer, Dodgers, film, hollywood, Keith Thursby, obituaries. Bookmark the permalink.